The Giant Mole is a mole boss found in the caves under Falador Park. To access the caves, you must dig on the mounds of Falador Park with a spade, you’ll then be dropped into the caves below. Make sure and bring a light source, preferably a lantern to prevent it from being extinguished by the Mole. 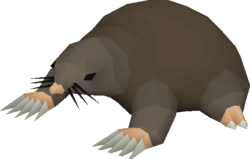 The Giant Mole is possibly one of the easiest bosses in Old School Runescape. Other than chasing the Mole around the caves as it burrows, there aren’t any more advanced mechanics than that. The main reason players kill the Giant Mole (especially Ironmen) is to gather Mole Skins and Mole Claws, which can be traded to Wyson the gardener in Falador Park for Birdsnests. The fight against the Giant Mole is an easy one – using the Dharoks method you want to use your Dwarven Rock Cake to bring your HP down to 1 to maximize your damage output. You can then use the Protection from Melee Prayer to ensure that you don’t take any damage, and simply chase the Mole around the caves and do as much damage as possible. If you’re lucky, you may be able to kill the Giant Mole in just a few hits with your Dharoks, if not you may find yourself running around for a couple of minutes while the giant Mole annoyingly digs himself around the caves.